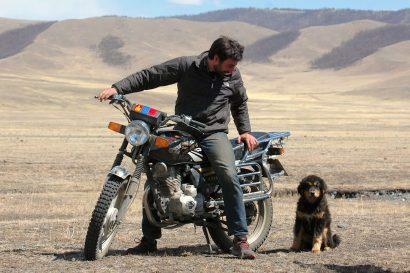 Editor’s Note: This article was originally published in Overland Journal, Winter 2017. Like all young boys, my childhood was filled with fanciful tales of soldiers clad in shining armor, new lands explored, and the quest for treasure. As a resident of Glasco, Kansas, I assumed such exploits only unfolded in places distant, if not imagined. The sea of wheat that surrounded me betrayed my appreciation of the truth, as such characters and narratives actually played out just miles from my house. When I first heard his name, Francisco Vázquez de Coronado y Luján, he sounded like an implausible actor in my local history. I was well acquainted with the many yarns spun of cowboys, Indians, and pioneers who scratched a meager living out of the dirt, but the notion of a Spanish conquistador exploring my familiar haunts in 1541 in search of golden cities—that was too far-fetched for even an imaginative 10 year old. In Coronado’s own words, “Neither gold nor silver nor any trace of either was found.” Nonetheless, he is inextricably tied to the hills and prairies of my home state. It was long after I had left Kansas in my early twenties before I began to fully appreciate my natal plains. A region frequently overlooked and once dubbed by explorer Stephen H. Long in 1820 as the Great American Desert, it is in all fairness quite bucolic, vibrant, and storied. After a lifetime pushing as far from it as I could, I have come to value the continent’s interior for what it is. It is not a wasteland inhabited and visited only by those forced to. The plains are and forever have been, a place of opportunity, natural splendor, and surprisingly—of seekers. Although I had not been there in years, it has always been my touchstone. Wherever I go in the world, I can’t help but view it through the eyes of a towheaded kid from the prairie, and after far too much time away, I felt an irresistible pull to go home. I didn’t have a plan when I set out and knew I couldn’t begin to cover even a tiny fraction of the immensity known as the Great Plains. Stretched from Mexico well into Canada, the flatlands, as they are commonly and pejoratively known, encompass more than half a million square miles. It was not long ago when it was wild and untamed, although I would argue much of it still is today. Nature holds a hard claim to the land and the rural population of the region is dwindling with the passing of each successive generation. 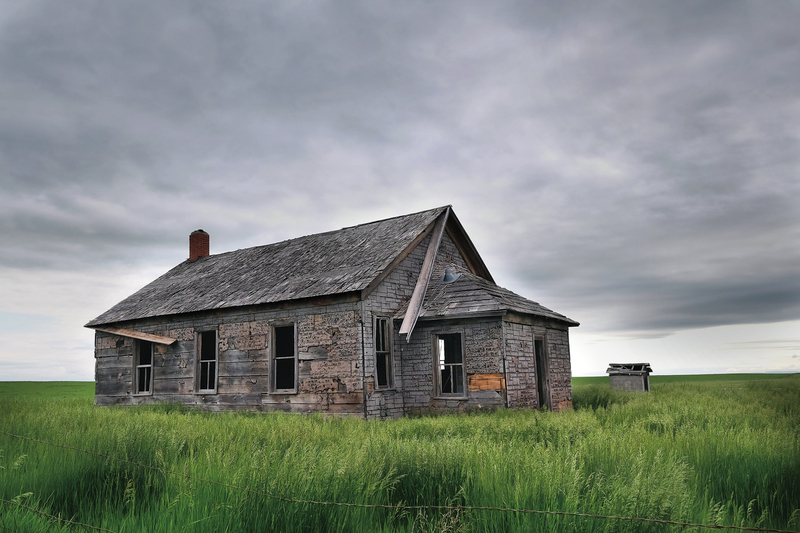 Ghost towns and abandoned farms are omnipresent, suggesting enormous swaths of the heartland may once again return to an undomesticated state. When I was a kid, my small hamlet of 600 residents looked like most others in the area, which is to say quaint if not a little ragged around the edges. A half-hour drive to the nearest stoplight, it was in many respects already a modern-day ruin. In the vim of my youth, I whiled away summer days playing in empty buildings and vacant lots strewn with the rusty detritus of a more prosperous era. I often wondered what the town looked like during its heyday when it was populated shortly after World War II by young servicemen, like my grandfather, and their fledgling families. Judging by the grandeur of the buildings, wide-open lanes, and rows of Victorian houses clinging to their former glory despite egg-cracked paint and missing shingles, it must have been a scene befitting a Norman Rockwell painting. As I piloted my motorcycle along narrow dirt and chip sealed roads, similar communities spaced at predictable intervals like barbs on wire proved my town was only one of hundreds to suffer the same fate. If there is a dearth of residents within the town proper, the outlying areas are usually even more forsaken. Everywhere I traveled stood derelict farmhouses and the fragile shells of barns bent slightly in the direction of the prevailing wind. Thickets of white ash and hackberry trees encroached on once manicured lawns, with old trucks and tractors swallowed whole by ropes of feral vines. In the desert west, people will travel long distances to visit an old mine, homestead, or some other rotting relic of boom gone bust. I had ridden past dozens of such edifices and it wasn’t even lunchtime. It’s hard to not wonder where those people came from, and where they had gone. The rush to the center of the continent began in earnest in the late 19th century when the territory was vaguely charted and appropriately referred to simply as the frontier. 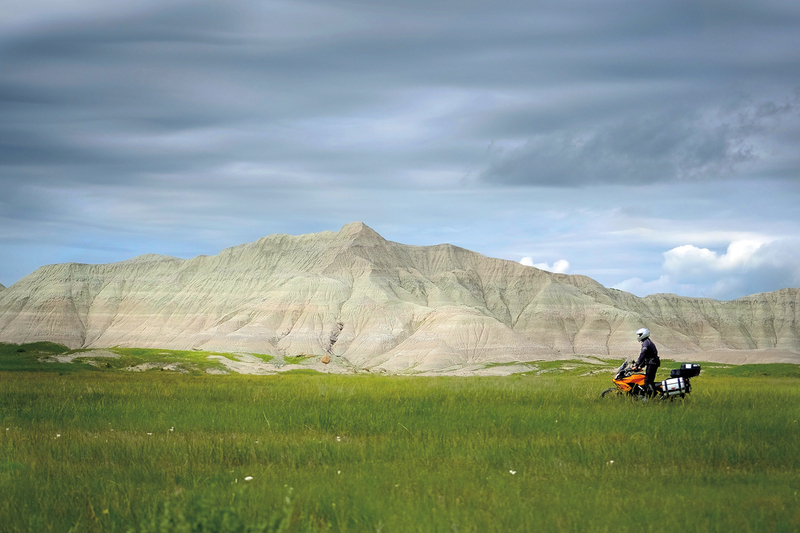 Shortly after the Homestead Act was penned in 1862, a veritable tide of humanity flooded the plains in meandering currents known as the Oregon, Mormon, and California overland trails. 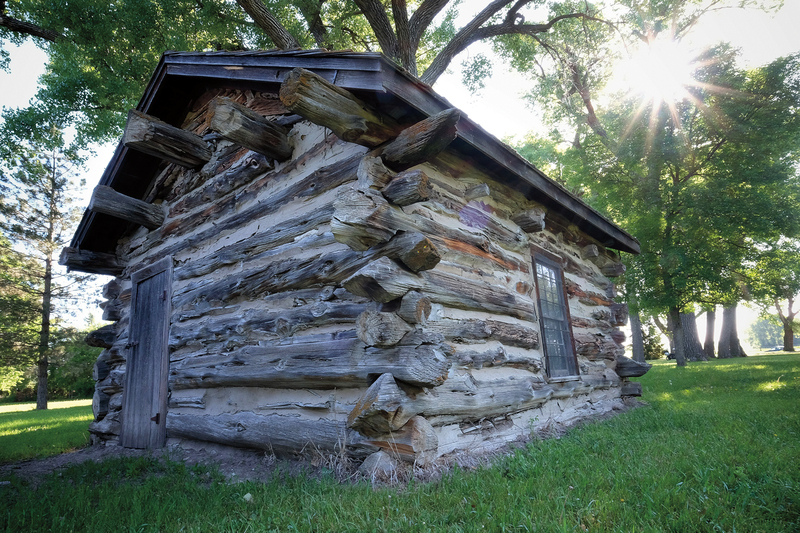 Where the wagon trains slowed and eddies formed, towns sprang up, and within a few years, more than 1.6 million settlers had ventured west into what they were told was the land of milk and honey. The reward for their arduous passage was the promise of 160- acre plots of fertile land—free for the taking. Some were fleeing the devastation and prejudice of the Civil War. All were gambling everything for a life made better. What they found was opportunity hard-won through years of agonizing hardship, toil, and sacrifice. Those not crushed into despair survived only by a work ethic and determined grit that persists today in the people of the plains; qualities I hope still pulse through my own veins. In 1877, a small group of freed slaves made the difficult journey into the newly established state of Kansas, arriving at a fecund valley near the banks of the Solomon River. The same lazy ribbon of water in which I used to play as a boy, it is where they established their new home and one of the first African- American townships in the territory. As was the case with many upstarts of the time, in just a few years its population ballooned to over 600 thriving residents. Churches were built, schools filled with children, and the virgin soil sown with crops. 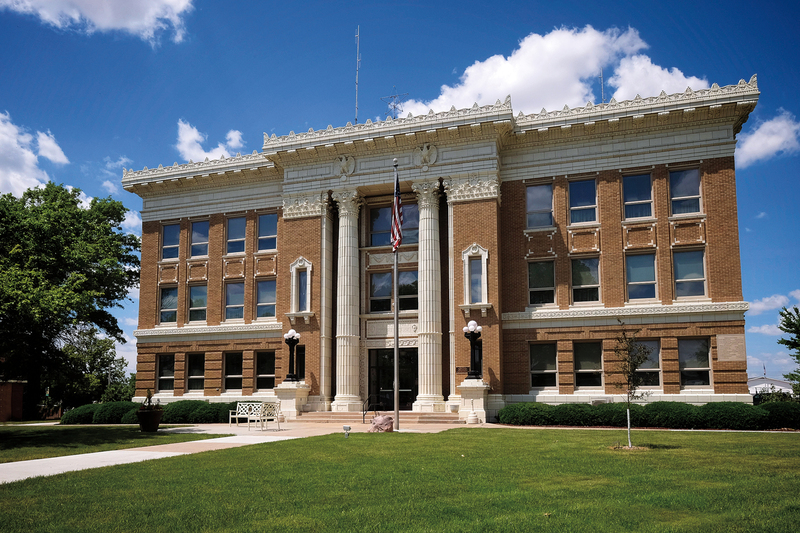 But the frontier was not an easy place to dwell and by the 1930s the once-flourishing town of Nicodemus had been reduced to only 40 resolute individuals. Today it remains the oldest surviving town, and just barely so, founded by liberated slaves. Until very recently, it was also the unlikely location for one of the best barbecue restaurants in the country. Had it not been for Ernestine’s pork ribs and a recipe handed down through the generations, I may have never learned of the town’s rich history. The near demise of Nicodemus, as it was for thousands of similar communities like my own, can be attributed to a number of factors, the extensive tillage of new agricultural ground most notable. 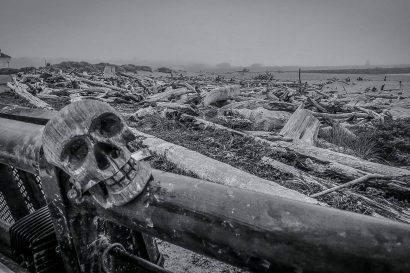 We humans have always underestimated our leverage over the environment and no greater evidence exists than the period of time in the 1930s when 100,000,000 acres of land stretching from Texas to Nebraska were known ominously as the Dust Bowl. These were the years preceded by drought and compounded by the Great Depression which spawned John Steinbeck’s classic novel, The Grapes of Wrath. If the late 19th century heralded the collective migration to the frontier, the diaspora following the 1930s would continue throughout the next several decades as people fled for larger cities. Riding by a dilapidated schoolhouse on the edge of a wheat field, I realized I can be counted amongst the millions to have joined the exodus. For the traveler to the open spaces of the Great Plains, such anecdotes from our nation’s collective story are not overtly displayed. There are no towering monuments, only quiet whispers of layered epochs teetering on the brink of forgotten. 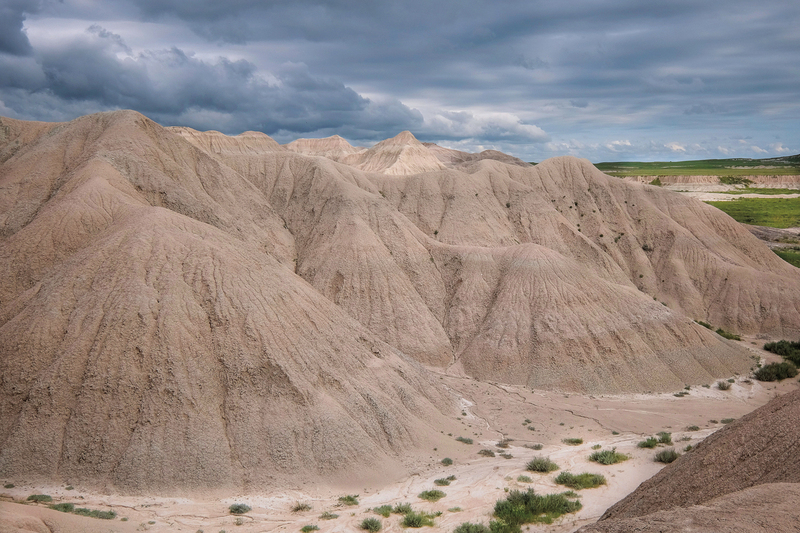 While speeding down a lonely highway along the southern edge of Nebraska, I spotted a small sign with the words Massacre Canyon scribed in faded paint. Less of a crack in the earth and more of a shallow depression in the flatness, the serenity of the scene belied the events of its namesake. It was there in 1873 where more than 1,000 native Sioux warriors descended on a buffalo hunting party of 400 Pawnee men, women, and children, killing nearly half of them in what was one of the frontier’s last major battles. As I stood on the roadside, the rhythmic squeak of a nearby windmill carried on the breeze; I couldn’t escape the gravity of the place and the terror that once bloodied its tall grasses. The day’s light waning, I continued on into the heart of Nebraska, the views changing rapidly with the passing of each mile. Gone were the cultivated fields and water towers as seen above every town, big or small. The road networks, usually divided in 1- and 5-mile grid sections, suddenly abated and the crisp line that bisected the sky and earth as if drawn with a straight edge began to undulate. I had arrived amidst the millions of grass-covered dunes that comprise one of the country’s most extensive and unspoiled landscapes: the Sandhills. Few travelers, including me, think to visit the 20,000 square miles of prairie where nearly 85 percent of the land is ecologically exactly the same as it has been for thousands of years. With fewer than 10,000 residents, the Sandhills are one of the most sparsely populated places in the country. Webbed with narrow dirt roads knotted around seemingly endless tracts of hills, they are punctuated by hundreds of shallow ponds and lakes seeping upwards from the Ogallala Aquifer. One of the largest in the world, it is a subterranean inland sea covering 175,000 square miles. Massive as it is, extensive agricultural irrigation has now depleted it by as much as 10 percent in just a half century. If ever fully exhausted, experts suggest it could require more than 5,000 years to replenish. I wondered if the lessons of the Dust Bowl had been lost in the passing years. With my wheels cutting deep into bone-white sand, the road flanked by sedgy mounds rolling like green ocean swells, I was transported to a different century when the landscape was trodden by buffalo in herds so enormous their numbers seemed infinite. They are in singularity magnificent creatures, but it was their once great number that is so fascinating, and at the same time forlorn. 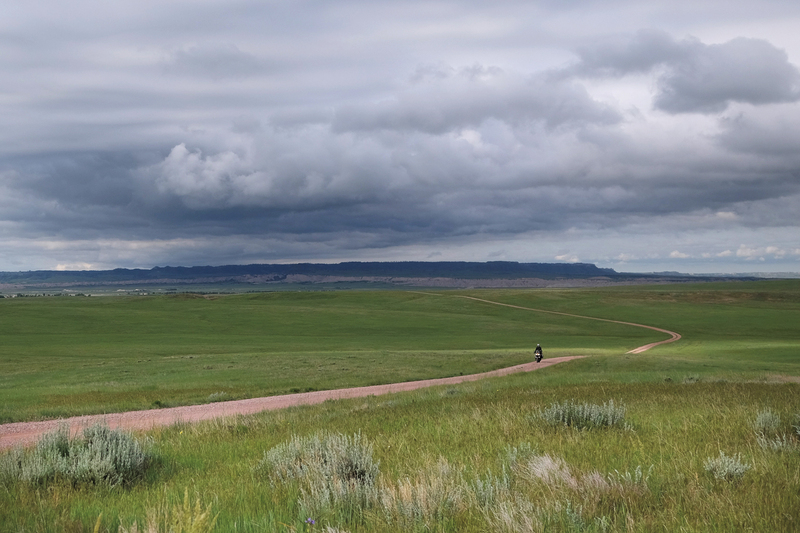 While traveling through the Oglala National Grassland of northwestern Nebraska, the narrow two-track I had been riding for several hours rounded a knoll where a lone buffalo stood in the far distance. I dismounted my motorcycle, unpacked my lunch, and sat in the grass while I watched thunderheads snag on a low butte. An upland sandpiper pecked at the ground and made its awkward strut between clutches of small purple flowers, periodically stopping to scan the sky for the Swainson’s hawk circling overhead. Just as the lone buffalo lumbered over a hill and out of sight, the storm to the west unleashed a low rumble as if to echo the ghostly and thunderous sounds of buffalo long since gone. Quieted and filled with a profound sense of aloneness and tranquility, I let my mind wander once again to Coronado. When the Spaniards arrived in the 16th century, they brought with them hundreds of horses, many left to fend for themselves as their masters perished or retreated. Within 2 centuries they had multiplied to nearly a million strong. 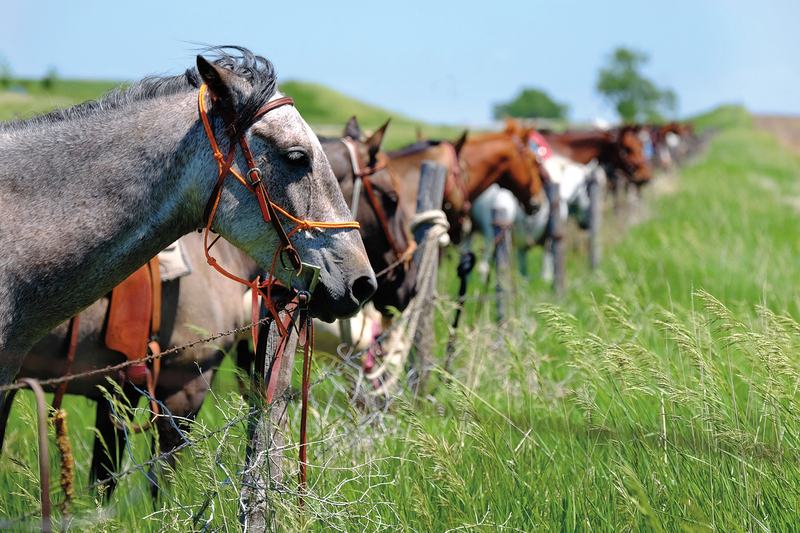 The indigenous tribes of the plains were quick to domesticate the wild horse and in doing so tipped the delicate balance between man and beast. Due to their newfound mobility, the natives had begun harvesting buffalo at an unsustainable rate, killing more than 750,000 animals by the mid-1800s. Only 50 years later, furthered by rapacious hide hunters, an additional six million were slaughtered, bringing them to near extinction. In their place, 30 million bony cattle, many ill-suited to the harsh environment, roamed the prairies ushering in one more significant shift in the saga of the plains. My gas reserves nearly tapped out, I unfolded the map I had not used all week and plotted a course to civilization. It’s surprising how lost one can get in the enormity of the grasslands. After another hour riding on tiny roads, some graded smooth, others pocked and rutted, I crested a rocky escarpment looming over a tree-filled valley several hundred feet below. 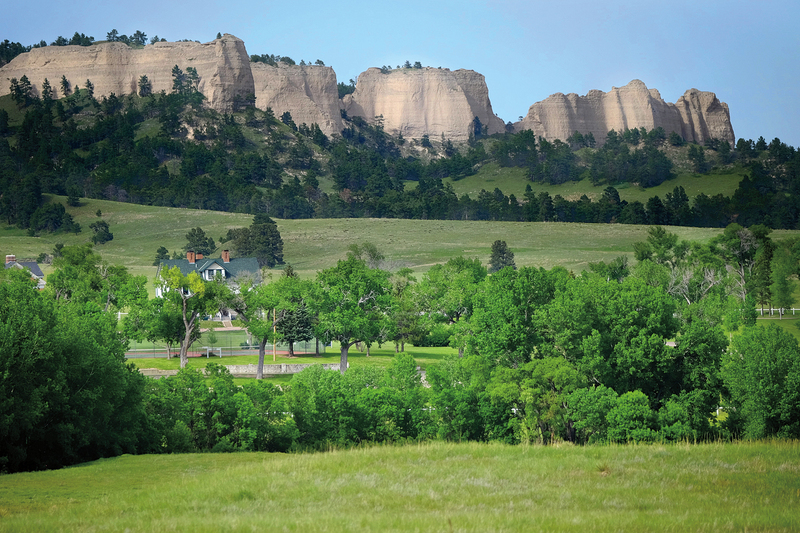 I had arrived through a back route to the sprawling compound of historic Fort Robinson. 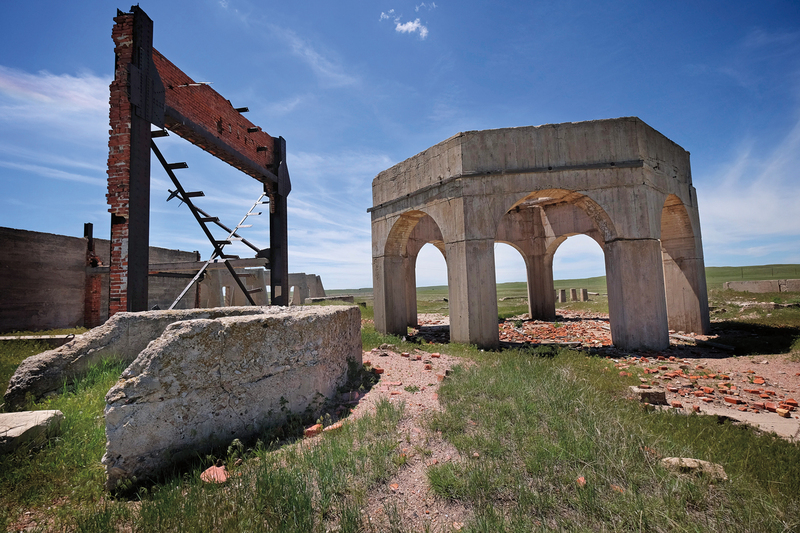 Immaculately preserved, with dozens of stately buildings placed around freshly trimmed parade grounds, in the late 19th century it was the most remote and isolated military outpost on the frontier. After a quick tour of the grounds, the sun once again restored to full strength, I tossed my jacket under the shade of a cottonwood tree and resigned myself to a routine midday nap. Laid low in thick grass, I noticed a small rock monument only a few feet away. Curiosity getting the better of me, I strolled over to read the modest marker. On this spot Ogallala Chief Crazy Horse was killed. Sept 5, 1877. In the back of my mind, I could hear the voices of people who told me they had driven through Kansas and Nebraska, and it was boring. They said there was nothing there. Once again, my route plotted by dumb luck and visited by serendipity had delivered me to the place where Crazy Horse, a key strategist in Custer’s defeat at the Battle of the Little Big Horn, was stabbed by a bayonet while in surrendered custody. Like the vacant farmhouses, empty towns, and prairies devoid of buffalo, a stony slab scarcely 2 feet tall marked the end of yet another chapter in a collective story. 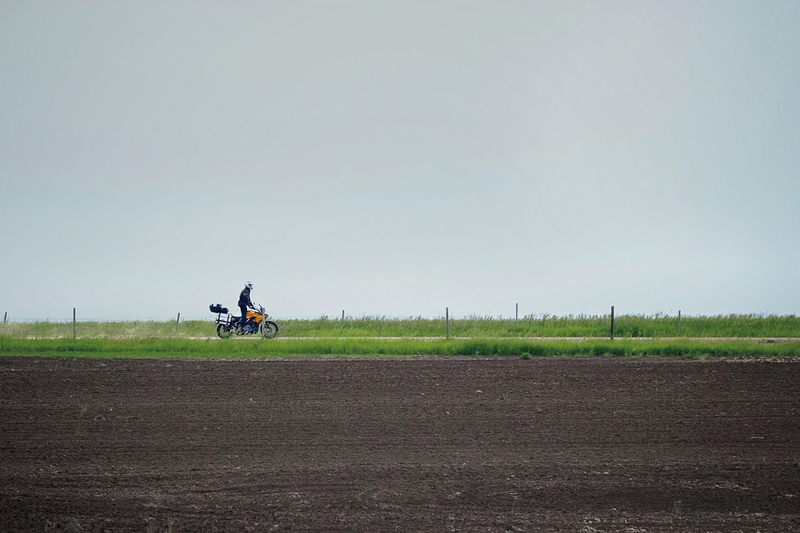 The following day, what I reluctantly decided would be the last of my trip, I rode into the desolate streets of Crawford, Nebraska. I found the town’s one café and as I had done for nearly every day for a week, ordered the daily breakfast special; this time a plate mounded with scrambled eggs and a side of fried chicken gizzards. Brought to my table by an older woman with a kind face, she casually addressed me as “darlin’” every time she approached to refill my chipped cup with coffee black as oil. In the corner of the restaurant, a klatch of local retired farmers sat at a table, its weathered surface wearing the scratches and stains of decades of use. They sipped their coffee and palavered over subjects they had most likely covered every day of their lives. 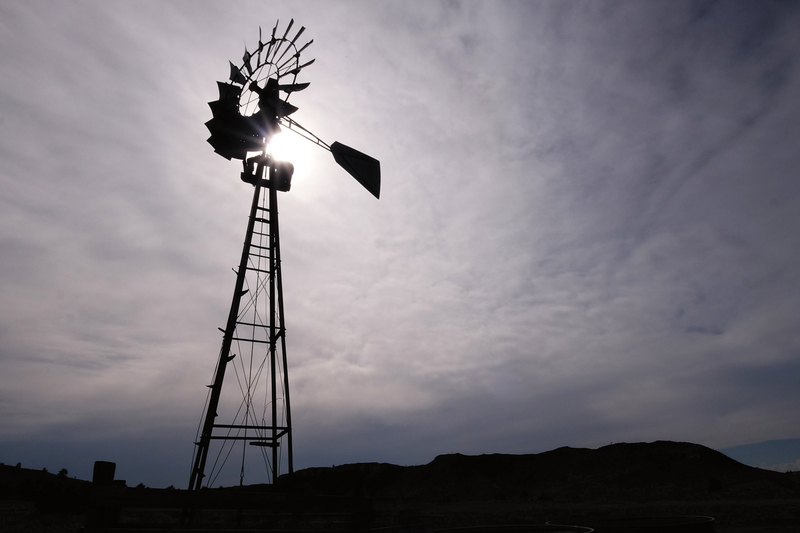 There was speculation about the coming harvest, the state of the aquifer, and one man chided his kids for not working their fields due to failed air conditioning in their tractor. It seems everyone thinks their subsequent generations have gone soft, and maybe they have. I overheard concerns of beef prices, low crop yields, and old friends moved to the city or laid to rest. Café chatter is refreshingly consistent throughout the region and hasn’t changed in decades. It brought me strange comfort. A morning ritual played out in thousands of small eateries across the plains, it once again transported me to my childhood and the farmers of my hometown. My stomach made heavy with a meal intended for a harder working appetite than mine, I pointed my wheels west toward Colorado. I cruised through the Pawnee National Grassland and before long was back on four-lane highways, the Rocky Mountains visible in the distance. For the pioneers and explorers to have survived crossing the flatlands only to confront their largest obstacle yet must have dashed hopes. For me, my heart was heavy knowing I was headed to my adopted home in the Southwest. The sky already seemed lower, smaller. We are all lucky to be travelers and our wanderlust often compels us to visit destinations exotic and far-flung. 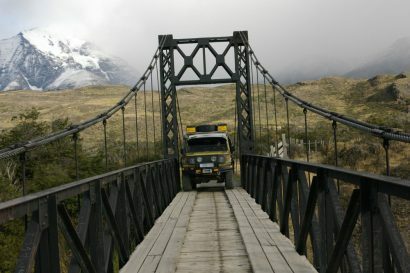 Sometimes the most moving journey takes us to places familiar, but not completely known. Settled deep into the seat of my motorcycle, my mind drifted to my boyhood, to catching frogs on the muddy banks of the Solomon River, not far from where Coronado’s men conceded defeat and retreated to Mexico City. They had been to Kansas and there was—nothing there. Everyone comes from somewhere, and that provenance, whether we like it or not, often defines who we are and what we value. The more I see of the world the more my roots dive deep. I have been many things, and hope to be many more in my remaining years, but I will always be—and proud to be it—a son of the plains.